We first review empirical evidence that asset prices have had episodes of large fluctuations and been inefficient for at least 200 years. We briefly review recent theoretical results as well as the neurological basis of trend following and finally argue that these asset price properties can be attributed to two fundamental mechanisms that have not changed for many centuries: an innate preference for trend following and the collective tendency to exploit as much as possible detectable price arbitrage, which leads to destabilizing feedback loops. "Many theoretical arguments suggest that volatility bursts may be intimately related to the quasi-efficiency of financial markets, in the sense that predicting them is hard because the signal-to-noise ratio is very small (which does not imply that the prices are close to their “fundamental” values). Since the adaptive behaviour of investors tends to remove price predictability, which is the signal that traders try to learn, price dynamics becomes unstable as they then base their trading decision on noise only. This is a purely endogenous phenomenon whose origin is the implicit or explicit learning of the value of trading strategies, i.e., of the interaction between the strategies that investors use. This explains why these stylized facts have existed for at least as long as financial historical data exists. Before computers, traders used their strategies in the best way they could. Granted, they certainly could exploit less of the signal-to-noise ratio than we can today. This however does not matter at all: efficiency is only defined with respect to the set of strategies one has in one’s bag. As time went on, the computational power increased tremendously, with the same result: unstable prices and bursts of volatility. This is why, unless exchange rules are dramatically changed, there is no reason to expect financial markets will behave any differently in the future. Similarly, the way human beings learn also explains why speculative bubbles do not need rumour spreading on internet and social networks in order to exist. Looking at the chart of an asset price is enough for many investors to reach similar (and hasty) conclusions without the need for peer-to-peer communication devices (phones, emails, etc.). In short, the fear of missing out is a kind of indirect social contagion. Neurofinance aims at studying the neuronal process involved in investment decisions. One of the most salient result is that, expectedly, human beings spontaneously prefer to follow perceived past trends. Various hormones play a central role in the dynamics of risk perception and reward seeking, which are major sources of positive and negative feedback loops in Finance. Human brains have most probably changed very little for the last two thousand years. This means that the neurological mechanisms responsible for the propensity to invest in bubbles are likely to influence the behaviour of human investors for as long as they will be allowed to trade." The original academic paper is written by Jason Wei of the University of Toronto. He proposes a theory that momentum and reversals coexist and that volatility is a strong predictor of performance in a cross-section for both anomalies. Wei's research is detailed in the paper titled “Do momentum and reversals coexist?” and states that rather than assuming momentum and reversals as separate phenomena, the two occur simultaneously. Further, Wei also studies return predictability along the volatility (and size) dimension. Wei’s research documents that for large-cap/ low-volatility stocks, reversals prevail while large-cap/high-volatility stocks experience momentum. Jeremy Muhia from Quantopian performed an independent analysis of a resultant long-short strategy (investor goes long high volatility winners and goes short low volatility losers) during last 6 years (an out of sample period from 2011 until 2017). Overall, the performance of a simple long-short strategy is below the market and equity curve looks flat during last 2+years . But, it has to be noted (like in the previous analysed reversal strategy) that this strategy is long/short compared to just long-only equity benchmark (which is the SPY ETF). Strategy has a Sharpe ratio 0.66 (not very spectacular, but not very bad either) and Beta of 0.02 (low correlation to overall market). So does it make sense to implement it? It depends. Flat equity curve during last 2-3 years can indicate strategy's deterioration. But we believe a longer backtest is probably necessary to have a better understanding. As such episodes of underperformance could be easily just a temporary and longer backtest can show how strategy performed during more business cycles. Overall, we really like Jason Wei's research idea of looking at several sorts/dimensions at the same time (past long/short performance+past volatility+company's size). Thanks for the analysis Jeremy. Most market participants are risk adverse and people tend to close their long positions once they perceive a formation of downturn in the market. Large sudden price drops can always be observed near the end of uptrends. On the other hand, people tend to have their own preferences in deciding the market entrance timings and large sudden price changes are relatively less commonly observed near the end of downtrends. Typical Moving Average strategies employ the same approach, using a single pair of time series, to locate the ending points of uptrends and downtrends. This approach does not consider the asymmetry of price changes near the end of uptrend and downtrend distinctively. To cater for the differences, a new approach using distinct pairs of time series for locating uptrends and downtrends is proposed. Performance of the proposed strategy is evaluated using stock market index series from 8 different developed countries including US, UK, Australia, Germany, Canada, Japan, Hong Kong and Singapore under 3 moving average calculation methods. The empirical results indicate that the proposed strategy outperforms the typical strategy and the buy-and-hold strategy. Recommended heuristics for selecting an appropriate MA length will also be addressed in this study. "This paper addresses the issue of asymmetrical information content observed in uptrend and downtrend patterns which is caused by investors’ risk aversion preference. The existence of the asymmetrical information content indirectly supports the use of distinct ways to identify uptrends and downtrends separately. 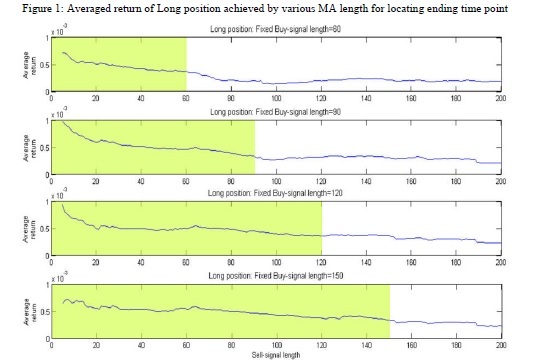 To illustrate the effect of using various MA lengths for locating the ending time points of uptrends, we fix the MA length for generating buy-signals ( pl ) and adjust the length for generating sell-signal ( ql ) iteratively. The average return of Long positions identified by strategies using ql from 5 to 200 pairing with 4 fixed values of pl are computed. The results are depicted in Figure 1. There are four sub-plots in Figure 1 and each plot represents the average return achieved by a fixed pl and varying ql. The four plots depict the performance of fixed buy-signal length of 60, 90, 120 and 150 respectively. The highlighted area on the left side shows the performance of using a shorter length to locate the ending time points (i.e. ql < pl ). The performance of the typical symmetric approach can be found on the boundary of highlighted area where ql = pl . It is observed that shorter lengths for locating the ending time points are always more preferable than longer lengths in all four settings. A short length for generating sell-signals (i.e. ql = 5 to 7) always gives the best performance under various settings for generating buy-signals, in additional to the illustrated lengths of 60, 90, 120 and 150. Preference to shorter lengths for generating sell-signals is also observed in other data sets and different MA trading strategies as well. The empirical results support our speculation that a more responsive way (i.e. small ql ) should be used to locate the ending time points of uptrends. A new Moving Average trading strategy is proposed to model the ending time points of uptrends and downtrends under an asymmetrical setting. The results show that a more responsive way (i.e. using a shorter MA length) to locate the ending time points of uptrends always helps to achieve a better average return. Based on our empirical data, a short MA length (i.e. 5-7) for generating sell-signals always gives good performance in uptrend identification. About downtrend identification, however, not any consistent clues in selecting appropriate MA lengths can be found. Moreover, it is shown that the asymmetric approach provides much larger improvement on uptrend identification than downtrend identification in general." We analyze the worst currency carry loss episodes in recent decades, including causes, attribution by currency, timing, and the duration of carry drawdowns. To explore the determinants of the length of carry losses, a model of carry drawdown duration is estimated. We find evidence that drawdown duration varies systematically with expected return from the carry trade at the onset of the drawdown, financial stress indicators and the magnitude of deviations from a fundamental value portfolio of the carry-related portfolio holdings. In an out-of-sample test, we show that these determinants can be used to control carry-related losses and improve investment performance. This paper investigates how jump risks are priced in currency markets. We find that currencies whose changes are more sensitive to negative market jumps provide significantly higher expected returns. The positive risk premium constitutes compensation for the extreme losses during periods of market turmoil. Using the empirical findings, we propose a jump modified carry trade strategy, which has approximately 2-percentage-point (per annum) higher returns than the regular carry trade strategy. These findings result from the fact that negative jump betas are significantly related to the riskiness of currencies and business conditions. Theory predicts that securities with greater limits to arbitrage are more subject to mispricing and thus should command a higher return premium. We test this prediction using the unique regulatory setting from the Hong Kong stock market, in which some stocks can be sold short and others cannot. We show that no-short stocks on average earn significantly higher returns than shortable stocks and the two groups of stocks tend to comove negatively. Moreover, stocks that comove more with the portfolio of no-short stocks on average earn higher subsequent abnormal returns while those comoving more with the shortable stocks earn lower subsequent abnormal returns. New additions to and deletions from the shorting list only partially contribute to the no-short return premium. "We test the existence of a mispricing return premium associated with a specific form of limits to arbitrage, short-sale restrictions, using a unique regulatory setting from the Hong Kong stock market. In the Stock Exchange of Hong Kong, short-sale restrictions apply to a subset of stocks but not the others. Stocks can be added to or deleted from the shorting list over time among the pool of stocks satisfying the criteria based on market capitalization, liquidity and so on. Thus, we can test whether the no-short stocks, presumably more subject to mispricing, earn a return premium relative to the shortable stocks. We do so by controlling for factor exposures and firm characteristics potentially correlated with the shorting list selections or expected stock returns. Over the sample period 1997-2014, we find that no-short stocks on average earn a higher monthly return of 2%, or a higher abnormal monthly return of 1.32%, than shortable stocks. We term the return spread between the no-short and shortable stocks the no-short (NMS; no-short minus shortable) factor. The no-short factor premium estimate is consistently positive and statistically significant, robust to the adjustment for firm size, liquidity, and exposures to common factors such as the Fama and French (2015) five factors and the Hou, Xue, and Zhang (2015) four factors. The strong predictive power of the NMS factor loadings extends to the full cross-section of individual stock returns, even in the presence of controls for firm size and book-to-market equity as well as a host of other firm characteristic variables. In other words, stocks that comove more with no-short stocks are expected to earn higher returns. Our interpretation is that these stocks embed higher risk of mispricing, and therefore command higher expected returns. Lastly, we consider an alternative, although non-mutually exclusive, explanation for our finding of the positive no-short return premium. Shortable stocks may underperform no-short stocks simply because newly established short positions exert a downward price pressure on these stocks when they become shortable. As shortable stocks may be added to and deleted from the shorting list constantly, newly shortable stocks earn average lower returns when short positions are being introduced and newly no-short stocks earn higher returns when short position are being unwinded. To test this alternative hypothesis, we exclude stock-months within a 12-month window from when stocks are added to or deleted from the shorting list. We find that these exclusions do not alter our baseline finding of the positive no-short return premium. Thus, shortable stocks underperform no-short stocks not solely during periods of introduction or removal of the shortable status."